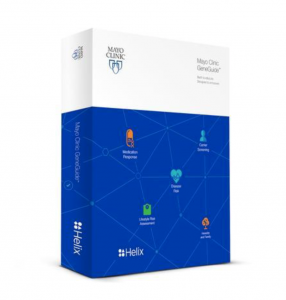 Mayo Clinic and Helix announced that they have together released a new DNA product called Mayo Clinic GeneGuide. It provides healthy individuals with genetic testing and insights with a focus on education. The product is backed by Mayo medical science and expertise. Mayo Clinic is a nonprofit organization committed to clinical practice, education and research. They provide expert, comprehensive care to each patient. Helix is a personal genomics company with a mission to empower every person to improve his or her life through DNA. Users receive genetic test reports that educate on health and disease risk. These risks range from complex illnesses and hereditary genetic conditions to how the body processes certain over-the-counter medications and physician-prescribed anesthesia. Decision-making tools help people better understand potential risks for specific health conditions. Individuals can share their results with their health care provider for informed decision-making on actions related to their health. * Powered by Helix’s Exome+ DNA sequencing, which reads reads and securely stores 100 times more data than other tests, enabling users to access additional products and services from the Helix store without providing another saliva sample. * The Mayo Clinic GeneGuide is available now on the Helix website for $199.99. The price includes $25.00 collected for an independent physician to review and determine whether the test is appropriate for you, and for genetic counseling services.